July 2012: release of the Jason-2 GDRs version "D"
Note that the last cycle produced in version 02_00 has already been delivered (cycle 39). The next cycle 40 will be produced only in version 02_01. The version 01_00 will be removed from the ftp site. 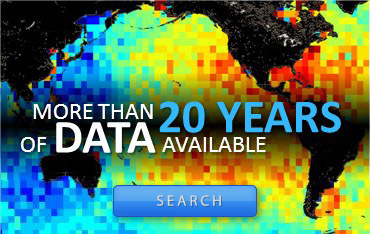 The Along-track Significant Wave Height Level-2+ (L2P) products are now available for Sentinel-3A and Sentinel-3B. These mono-mission products contain calibrated (relative to buoys) along-track significant wave height (SWH), a validity flag and the applied bias correction. These new products are processed by the Sentinel-3 L2P/L3 Marine Altimetry Service (CNES/CLS), in the frame of a EUMETSAT contract, part of the COPERNICUS Programme funded by the European Union. The products are available in Near-Real Time and the service is pre-operational till mid-june 2019. Please refer to the product sheet and disclaimer for more information. The details about the processing is described in the Product handbook. Sentinel-3 L2P are disseminated by AVISO+ (via ftp or AVISO+ CNES Data Center) and will also be disseminated by EUMETSAT via EUMETCast once the service will be fully operational, i.e. mid-June 2019. Over the last few weeks, SARAL has been encountering periodic nadir mispointing events the quality of AltiKa products can be uneven. in addition to standard quality flags. The ISRO Operational Team in charge of the SARAL platform is currently investigating various options to revert a nominal mission status and product quality. The products are available in Near-Real Time, Short Time Critical and Non time Critical and the service is operational. Sentinel-3B L2P are disseminated by AVISO+ (via ftp or AVISO+ CNES Data Center) and NRT/STC products will also be disseminated in the near future by EUMETSAT via EUMETCast. These products are processed by the Sentinel-3 L2P/L3 Marine Altimetry Service (CNES/CLS), in the frame of a EUMETSAT contract, funded by the European Union. 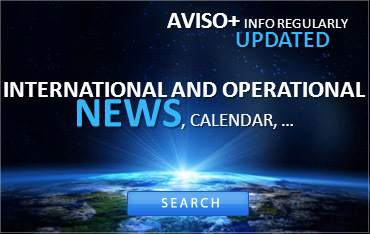 The new version 02_00 is disseminated by AVISO+ via ftp or AVISO+ CNES Data Center (see the product sheet). Note that the last cycle produced in version 01_00 has already been delivered (cycle 22). The next cycle 23 will be produced only in version 02_00. Upgrade of Delayed-Time CORSSH data including new standards (standards 2018) now called L2P products (for Level-2+). The format is adapted to the existing Sentinel-3A L2P products already delivered on AVISO+ (NetCDF format with change in the variables names). 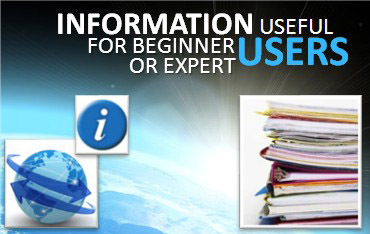 All information is described in the product page and in the handbook. The variables swh and sigma0 don't exist anymore in the L2P products. You will find those variables in the L2 products (GDR/IGDR/OGDR) on the AVISO+ dedicated web page product. 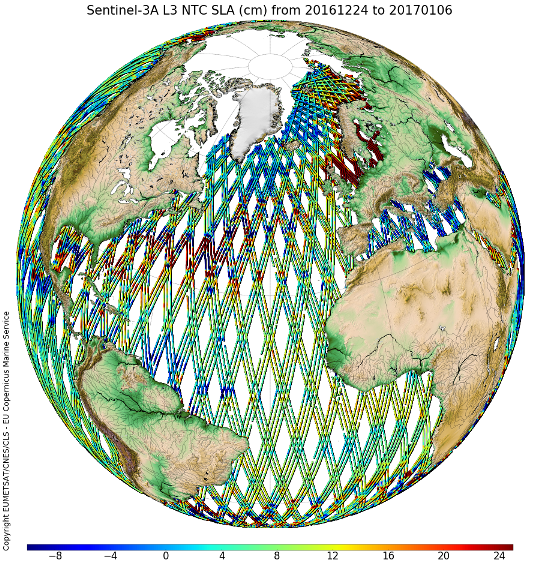 The products processed by the Sentinel-3 Level 2P/L3 Marine Altimetry Service (CNES/CLS consortium under an EUMETSAT Contract, funded by the European Union) have been delivered as a pre-operational service on the AVISO+ dissemination since December 15th, 2016 for L2P NRT, January 17th, 2017 for L2P STC (see AVISO+ web page product) and on the CMEMS Catalogue since April 19th, 2017 for L3 NRT/STC products. Dynamical atmospheric correction for L2P NRT products (instead of only inverted barometer height correction in the case of L2 NRT products). The distribution of L2P SLA near real time products splitted in passes (instead of 10 minute granules for L2 near real time products). The L3 Sentinel-3A products are global along-track products that contain time, sea level anomaly and absolute dynamic topography only for valid marine surfaces. The L3 products have under-gone a multi-mission cross-calibration process versus a reference mission (Jason-3). Considering the success of the pre-operational service delivery, EUMETSAT decided to begin the operational phase. Beginning on June 27th, the operational phase will imply the product’s warranty in terms of accuracy, fitness for use or purpose. will begin on June 27th for L2P on AVISO+ dissemination (delivery of cycle 12 on 27th and cycles 13 to 17 during the following week). To subscribe to AVISO+ L2P products, please fill in the registration form by choosing “Sentinel-3 Along-Track Level-2+ “. The L2P NRT/STC products are also available through EUMETSAT dissemination via EumetCast. 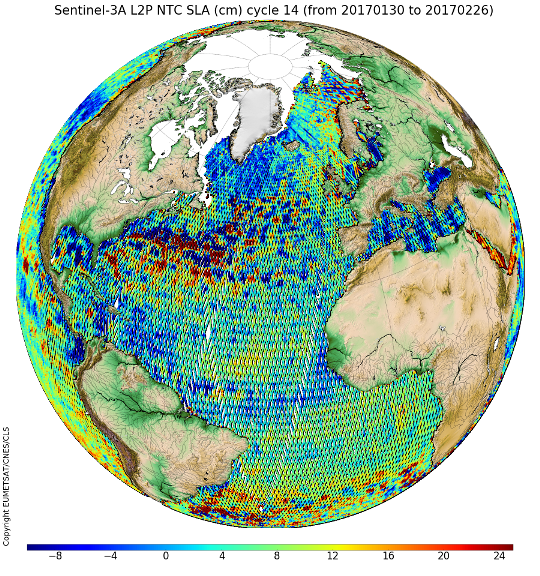 Mid-December 2016, we were pleased to inform you that a new type of Corrected Sea Surface Heights products (also known as L2P products) were now available for Sentinel-3A in Near Real Time. These mono-mission products contain along-track corrected sea surface heights with respect to a mean sea surface, corrections and geophysical parameters. The last versions of altimetric standards are used and there is a homogenized format for all satellites. These products are processed by the Sentinel-3 L2P/L3 Marine Altimetry Service (CNES/CLS), in the frame of a EUMETSAT contract, funded by the European Union. Today, we are pleased to inform you that CorSSH Short Time Critical (STC) products are released in pre-operational phase. They are available on the ftp server from January 12, 2017 (cycle 13 pass 241). Please refer to the product sheet and disclaimer for more information. All users have to subscribe to get access: please fill in the registration form by choosing “Sentinel-3 Along-Track Level-2+ “ even if you're already subscribed. Sentinel-3A CorSSH are disseminated by AVISO+ (via authenticated ftp or AVISO+ CNES Data Center) and in the near future, when the service will become operational, it will also be disseminated by EUMETSAT (via EUMETCast, EUMETSAT Data Centre and potentially via CODA). A User Handbook is provided at the above-mentioned ftp areas. The User Handbook provides details on the evolution of the version "E" products compared to the preceding version "C" products. Products are provided in NetCDF format instead of binary. 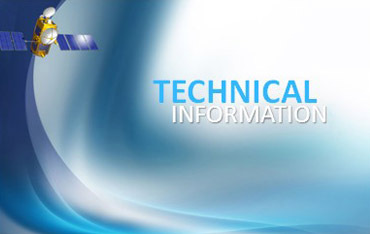 Orbit solutions are from so-called version "E" standards, based on ITRF08. Time tags are adjusted to correct for the datation bias that existed in previous versions (A, B, C) of the Jason-1 products. Recalibrated radiometer data, and application of near-land path delay algorithm. Altimeter wind speeds are recomputed using recalibrated atmospheric attenuations from radiometer. 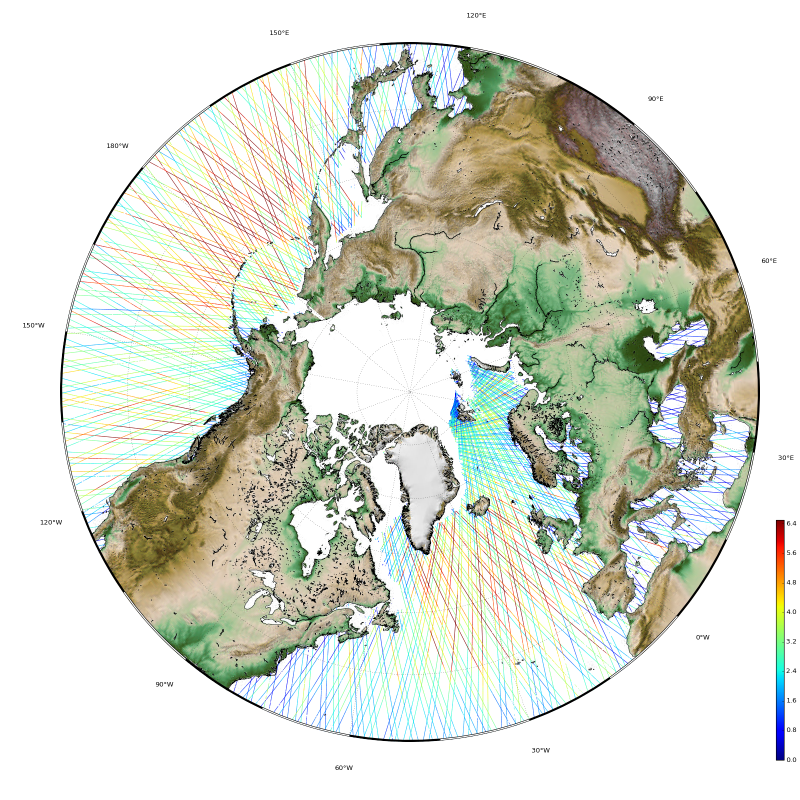 New Ku- and C-band sea state bias models, and values that are computed using revised wind speeds. Model wind speeds from ECMWF Reanalysis (ERA) in addition to previously available operational ECMWF. Inverse barometer and high-frequency corrections using ECMWF Reanalysis (ERA) in addition to previousl available operational ECMWF. Mean sea surface from MSS_CNES-CLS11, computed from a 20-year reference period. With this announcement, Jason-1 version E GDRs for 2002-2004 (cycles 1-110) are now available. 2005-2008 by the end of October. 2009-2013 by the end of November. The CNES and JPL science data system teams. The new GDR-E orbit standard becomes operational on May 26th, 2015! It is or will be used in all altimeter processing chains in coming weeks or months. For Jason-2, the new MOE GDR-E orbits will be released on May 26th, 2015 (made with data of May 25th). Thus, IGDRs products of May 26th 2015 will benefit from the new POD standard. Concerning the precise ephemeris, the new POE GDR-E orbit will be released for cycle 254. The OSTM/Jason-2 products Handbook has been updated. For Cryosat-2, the new standard is already operational since April 2nd, 2015 for MOE and during cycle 67 for POE (arc 260). Jason-3 POE orbits will be produced in GDR-E standards from cycle 1. Saral orbits will switch to the GDR-E standards on July 2nd (data of July 1st), 2015 for MOE and from cycle 25 for POE. Jason-1 POE orbits will be available by the beginning of July 2015. HY-2A & ENVISAT POE orbits will switch to the GDR-E standards at a later stage. and are now delivered on authenticated servers: FTP and the Online Data Extraction Service (ODES). CorSSH are monomission altimeter satellite products, with corrections and geophysical parameters. Significant wave heights and backscatter coefficient are also provided. These corrections are provided enabling you to add/adapt new formulas to apply them yourself. Note that monomission products by definition are not intercalibrated at crossover points. Thus Jason-1 and Envisat data for example may not be homogeneous at a given point, since their orbits are different. Note also that these products are not corrected from Large Wavelength Error (LWE), unlike multimission Ssalto/Duacs products. You can use the same login / password that you already have for downloading on the FTP server (as for the Delayed-Time / Near-Real Time Ssalto/Duacs products) and/or through ODES. Consequently, the old CorSSH version delivered on the anonymous FTP server will be soon deleted (the corresponding path was: /pub/oceano/AVISO/SSH/monomission/dt/corssh/ref). As one of major outcome of the first SARAL/AltiKa verification workshop in August 2013, the “patch 2” has been prepared to improve the data quality. The evolutions included in this patch are summarized below and the main impacts on ocean sea surface height are detailed in the pdf document. This calVal analysis was performed on CNES and CLS side using classical tools like Cross-Overs and SLA analysis. This memo provides early metrics computed on our side in order to ease the Saral Patch 2 use. This is based on the analysis of GDR data dated from mid-March 2013 to beginning of October (cycles 1 to 6). The Patch 2 evolutions have been analyzed thanks to a Saral dedicated prototype (PEACHI). The Calval analysis will continue with the routine monitoring of OGDRs, IGDRs and GDRs products. Wind look-up table: The table provided by NOAA is used. This table is only based on the measured sigma0, taking into account the atmospheric attenuation (sigma0 at the surface). (Reference: John Lillibridge et al. - One and Two-Dimensional Wind Speed Models for Ka-band Altimetry - JTECH-D-13-00167.1) SSB look-up table: The table provided by R. Scharroo is used. We use only the significant wave height to compute the SSB. Radiometer neural algorithm: Taking into account several months of AltiKa measurements, the neural network coefficients have been updated. Ice-2 retracking algorithm: The algorithm has been updated taking into account the AltiKa Ka band specificities (ice2 algorithm was based on ENVISAT Ku band experience). Matching pursuit algorithm: the algorithm based on J. Tournadre proposal has been tuned to comply to AltiKa Ka band specificities. MQE parameter scale factor: the scale factor of the MQE has been modified. Update of the altimeter characterization file: The altimeter characterization file has been modified in order to account for 63 values of altimeter gain control loop (AGC). This has impacts over sea ice and land hydrology, in some cases the AGC was set to default value in current P1 products. This patch will be installed on IGDRs products around January 21st 2014. And it will be installed on OGDRs processing chains (at EUMETSAT) around February 5th 2014. We will provide the actual installation dates and the name of 1st products generated with Patch 2 as soon as possible. Regarding the GDRs products, all the cycles will be reprocessed with the patch 2. As a consequence, the cycles 1 to 7 already disseminated (and generated with the patch 1) can be found on the AVISO ftp server in the directories named gdr_t_old / sgdr_t_old / ssha_gdr_t_old. The patch 2 products will be circulated on the gdr_t / sgdr_t / ssha_gdr_t directories. Access to the AVISO ftp server. We are pleased to provide this short synthesis of the Saral IGDR-T products data quality assessment over oceans. CalVal analysis was performed on Cnes and CLS side during past months using classical tools like Cross-Overs and SLA analysis. This memo provides early metrics computed on our side in order to ease the Saral use. This is based on the analysis of IGDR and OGDRs data dated from mid March 2013 to end of June. The Calval analysis will continue with the assessment of the first GDRs cycles and the routine monitoring of OGDRs and IGDRs products. We also like to mention that a patch has been prepared to correct for some anomalies and to account for the in-flight calibration data in the ground processing. The evolutions included in this patch are described in the pdf document. This patch has been installed on IGDRs products on July 11th. It will be installed on OGDRs processing chains around July 17th. On behalf of Cnes Saral project. The recent Jason-1 safe hold has impacted the calibration on the Jason-1 Microwave Radiometer (JMR). In particular, attitude dependent behavior of the JMR wet troposphere delay correction has been observed at the level of 1 cm. A new calibration is being developed by the JMR instrument team and requires in-flight data from additional attitude regimes. As a result, the Cnes and JPL science data teams have decided to delay Jason-1 GDR production until the new JMR calibration becomes available. We are expecting to return to the normal Jason-1 GDR production schedule in mid-July. Meanwhile, Jason-1 OSDR and IGDR production schedules will not be affected and will continue to be available as usual. Thank you for your patience during this delay in Jason-1 GDR production. Jason-1 is on its new geodetic orbit since May 2012. The cycle 500 is the first cycle of this geodetic mission and the CorSSH products are now delivered. No SLA is delivered after cycle 374 since the orbit is non repetitive. For Jason-2, monomission CorSSH and SLA are now using the version D of Jason-2 Geophysical Data Records (GDRs) standards starting from cycle 146. Previous cycles are still in version C, and will be reprocessed in the future. The Jason-2/OSTM GDRs version "D" has been prepared following the recent OSTST meetings. GDR: The reprocessing of the Jason-2 mission in GDR-D version started in May 2012. Cycles 1-36 (except 19) and 117-140 are currently available. We will continue reprocessing backward and we expect to complete the reprocessing before end of 2012. See the GDR product page. IGDR: The transfer in operations of the GDR-D standard for the IGDR production has also been performed. IGDR product generated with GDR-D standard will start with the first pass of cycle 150.
a description of the evolutions included in GDR-D standards (see : Jason-2 GDR-D standard, page 2). Further details are available in the OSTM/Jason-2 Product Handbook document. Jason-2 OGDRs, IGDRs and GDRs will switch to a new altimetric standard (version "D") this summer. A reprocessing campaign will process the four first years of mission to provide an homogeneous GDR dataset. Following the on-board anomaly on March 3rd, the Cnes-Nasa Joint Steering Group directed the Jason-1 Project to move the satellite to a geodetic orbit. The target orbit was 12+297/406 with a mean altitude at the Equator of 1323.4 km. Jason-1 maneuver operations were started on April 23rd with this baseline, and the first operations to lower the orbit were performed on April 25th. After an initial series of 4 maneuvers were completed, they encountered a serious new propulsion anomaly which resulted in the unexpected overconsumption of hydrazine. A 5th maneuver was designed in order to correct orbital eccentricity. At the time of this new anomaly, Jason-1 was -12.0 km below the reference altimetric orbit with 600m remaining to reach the -12.6 km goal, however there were very few grams of fuel remaining in the tank to continue orbit lowering. After checking the current orbit carefully, the operational team determined that a geodetic mission was still possible. It was also decided to preserve all remaining fuel for future station keeping maneuvers which is mandatory in a geodetic orbit. Core payloads were switched ON on May 4th and after some POSEIDON2 radar (PRF) adjustments the mission was resumed on May 7th at 15:12:48 UTC. For this new phase of the Jason-1 mission, the cycle numbering will restart at 500. Off-line products will be produced once a day for the IGDR and every 11 days for the GDR's. Since February 2011, the reprocessing of Envisat data in version 2.1 has begun and will continue during all the year 2011. It concerns cycles 10 to 92. The changes and comparisons between version 2.1 (IPF V6.04 and CMA V9.3_05) and the previous version (IPF V5.06 and CMA V9.2_03) have been analysed by: Ollivier A, J.F. Legeais, N. Granier, Y. Faugere, F-PAC Calval Team: "CalVal status on the Envisat V2.1 reprocessing impact on main altimetric parameters"
T/P: new non parametric Sea State bias solution from N.Tran et al. (2010) with up-to-date standards (e.g. : DAC or wind algorithm) and orbit solution. T/P: new orbit solution, kindly provided by GSFC. Jason-1: GDR-C used from 2009 reprocessing. ENVISAT: new non parametric SSB solution from S.Labroue. ENVISAT: GDR-C orbits used (from cycle 15). GFO: new orbit solution, kindly provided by GSFC. As the new solution is not allways available, the <dfn>GDR</dfn> orbit is also used with empirical coherency restoration in between. All missions: new mean profiles computed in coherency with the new standards and algorithms. New algorithms were applied to correct for time-averaging period discrepancies (e.g. : T/P = Jason-1) or ocean variability. The new mean profiles are still referenced over 1993-1999 for the sake of coherency, but they integrate a precious information from the most recent missions and datasets. All missions: minor upgrades of the editing process and complete re-editing based on new standards and corrections. The handbook has been updated to follow all changes. We are changing our ftp site to provide you with a better service. From now on monomission products (SLA monomission and CorSSH) are delivered on a new ftp site. The new ftp address is: ftp.aviso.oceanobs.com . This one replace the old one (ftp.cls.fr). After more than 7 years of service on the nominal ground track, the Jason-1 satellite began several maneuvers to be moved to a new ground track on January 26, 2009 after the end of repeat cycle 259. Several maneuvers shifted Jason-1 on its new orbit on mid-February. Nominal production of all data products in the new orbit resumed on 14-Feb-2009 at 20:51 UTC. Nominal science data delivery will continue for the remainder of Science Cycle 262. The first complete science cycle in the new Jason-1 orbit (Cycle 263) will begin at 04:18 UTC on 20-Feb-2009. Jason-1 assumes a new orbit midway between its original ground tracks but with a time lag of approximately 5 days with OSTM/Jason-2.The OSTM/Jason-2 satellite will continue the long term climate data record on the primary Topex/Jason-1/OSTM-Jason-2 ground tracks. Jason-1 monomission CorSSH and SLA are now using the new version C Jason-1 Geophysical Data Records (GDRs) standards, starting from cycle 233. Previous cycles are still in version B, and will be reprocessed in the future, following Jason-1 GDRs reprocessing. Early versions of some cycles (e.g. 220-239) of the version C GDRs were released in July, but have since been reprocessed with modified precise orbit ephemerides. Users are advised to download those cycles again, and to only use version C GDRs that have file generation times of August 12, 2008 onwards. All version C Jason-1 GDRs for all cycles will be available by the middle of 2009. Use of ITRF2005 reference frame and time variable gravity in precise orbits. In improved sea state bias model that is consistent with the MLE4 retracked altimeter data. Recalibrated JMR measurements using data from cycles 1-227. Wet tropospheric correction is now a composite of radiometer correction (further than 50 km from the coast) and model correction (between 10 and 50 km), with smoothing at the frontier. a new ice flag, similar as for ERS, is now applied. Attention: cycles 32, 60, 89, 90 et 91 are not validated yet and not delivered on the server. Envisat CorSSH and SLA products were reprocessed, modifications are the same as for Jason-1; please refer to previous information published on August 9, 2006. Sea State Bias correction is the one provided in the GDRs 'b' and is homogeneous all along the time period. With the new version of GDRs (cycle 136) IB correction based on a cartesian grid (cycle 1 to 135) was, by mistake, replaced by an IB correction based. GDR products (off line products): September, 20th 2005 (i.e. from cycle 41). Improvements concern MOE/POE orbit computation chains and new algorithms. More details about those improvements are available on ESA web site. GDR products (off line products): September, 14th 2005 (i.e. from cycle 136). This new version will be identified with the letter "b", therefore GDR Jason-1 products will be named "JA1_GDR_2Pb" from the start of the new chain. Both chains will use the latest GRACE geoid model developed by the LEGOS group (EIGEN-CG03C). The POE chain also takes into account GPS data (MOE orbits are computed with Doris data solely). See Choi et al., 2004. A new calibration file has been developed to correct for jumps in the JMR path delays and to minimize yaw state effects (Brown et al., 2004). Based on a second-order altimeter echo model, MLE4 simultaneously retrieves the 4 parameters that can be inverted from the altimeter waveforms: epoch, SWH, Sigma0 and mispointing angle. This algorithm is more robust for large off-nadir angles, (up to 0.5°, as encountered in August-September 2005). See Amarouche et al. 2004. New instrumental correction tables have been established, based on MLE4 algorithm (Thibaut et al., 2004). A specific empirical wind-speed model has been tailored to Jason-1 data by Collard et al. (2004). This represents an update from the previous version of the altimeter wind estimate (the previous algorithm was fitted on TOPEX data). Sea-State bias table has been recomputed accounting for the impact of the geophysical parameters used (Labroue et al., 2003). Note that this SSB table was derived from altimeter data that we computed from the MLE3 retracking algorithm. The two tide models (FES and GOT) have been updated to their latest versions (respectively FES2004 and GOT00.2). As before, both geocentric ocean tide fields (fields #77 and #78) also include the load tides from the respective models (also provided separately in fields #81 and #82), and the equilibrium long-period ocean tide (also provided separately in field #79). These two fields (#77 and #78) now also include the S1 oceanic response to atmospheric pressure based on the model from Ray and Egbert (2004). The FES2004 model now also includes the M4 ocean tide. Note that the load tide fields (fields #81 and #82) only include the load tides from the GOT00.2 and FES2004 models, and do not contain the load tides from the S1, M4, or equilibrium long-period ocean tides. Previously set to default value, this field is now calculated based on the predictions of the Mf, Mm, Mtm, Msqm tides from the FES2004 model. This field is provided as a correction to the equilibrium long-period ocean tide. To apply this correction, it should be added to fields 77, 78, or 79, depending on which ocean tide field is being used. CLS01 MSS model solution has been implemented (Hernandez, 2002). The correction is calculated from the Mog2D ocean model, and is only available in GDR products. Note that the IB correction is still taken from ECMWF atmospheric pressure products. This field is provided as a correction to the inverse barometer. To apply this correction, it should be added to field #74. S1 and S2 ocean tide effects have been removed from the inverse barometer correction (field #74) and from the non-tidal high frequency correction (field #75) as both ocean tides are now included in the ocean tide models. Note also that explicit models for the S1 and S2 atmospheric tides have been added into the dry tropospheric correction. A new table provided by Tournadre (2004) is used in ground processing for rain_flag determination.